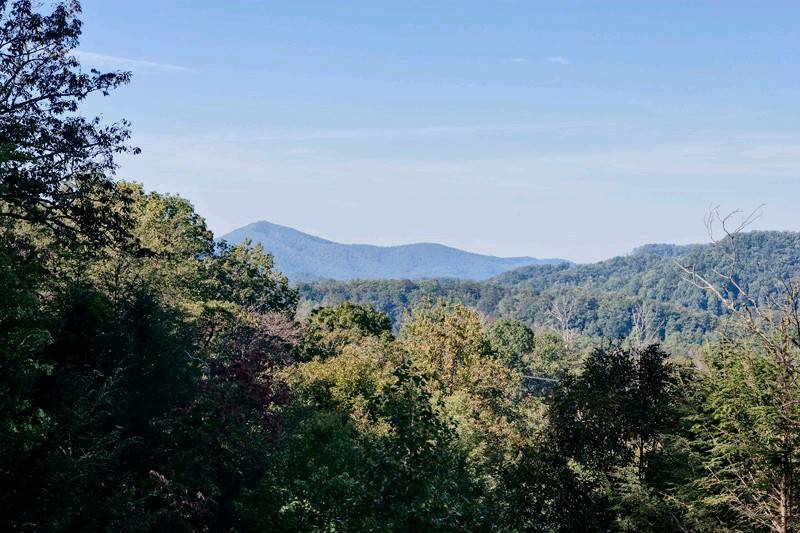 The road leading up to Mountain Dreams is completely paved and winds through the beautiful wooded area of the Great Smoky Mountains. You will find the Mountain Dreams cabin at the top of the hill surrounded by treetops and overlooking the mountains. There is only one other rental at the top and they are both facing opposite directions - therefore, you are guaranteed the utmost privacy during your vacation. 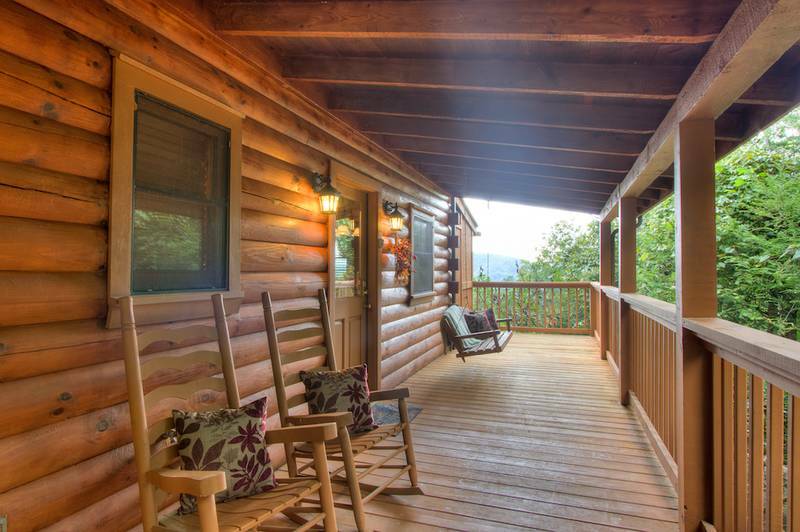 The front of the cabin is accentuated by a long covered deck with plenty of room for enjoying the tranquility of the Great Smoky Mountains. 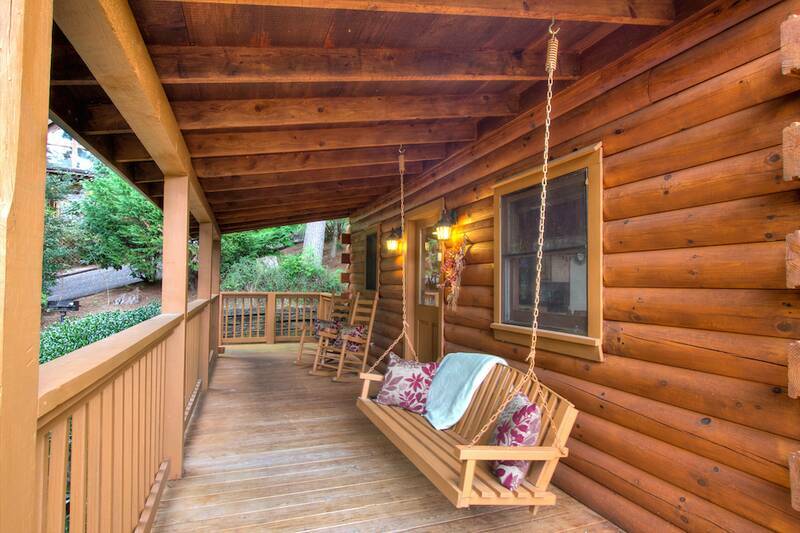 As you enter this beautiful log cabin you are taken by the quaint country charm of the decor. To the left of the main entrance is a fully equipped kitchen and laundry room. To the right you will find a beautifully decorated dining room with a solid redwood dining room table. By the dining room you will find the living room with wide glass doors that may be opened in order to view the beautiful mountains from the serenity of your own log cabin and leads out to the screened in deck. As well as this, there is an inviting gas burning fireplace situated in the living room for your pleasure during those cold months of the year. On the lower level off of the living room you will find a King Sized bedroom with a Flat Screen TV and with it's own private bath. The bath is fully equipped with both shower and bath tub. Upstairs you will find the master bedroom. Within the master bedroom you will find a large Jacuzzi tub, king size bed, flat screen TV, gas fireplace and your very own private deck. Located in the master bedroom is a private bath as well, with shower and bath tub. Out of the large glass doors in the living room you are presented with a screened-in deck overlooking the mountains. 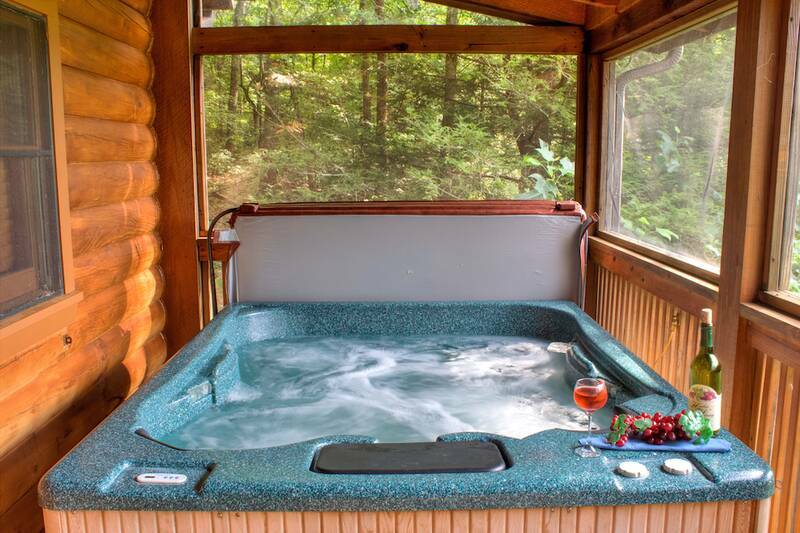 Located on the screened-in deck you will find the hot tub and your very own sauna. 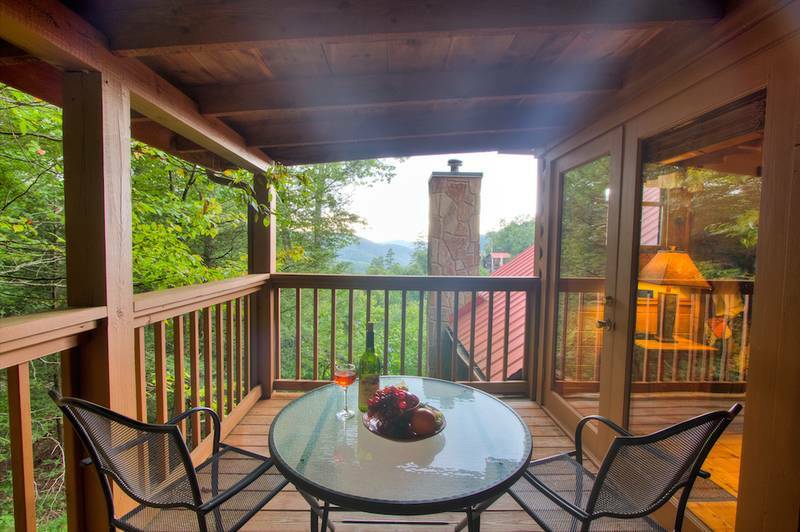 You will also find your own private mountain view of the beauty known as the Great Smoky Mountains. A perfect honeymoon hideaway or a couples retreat. 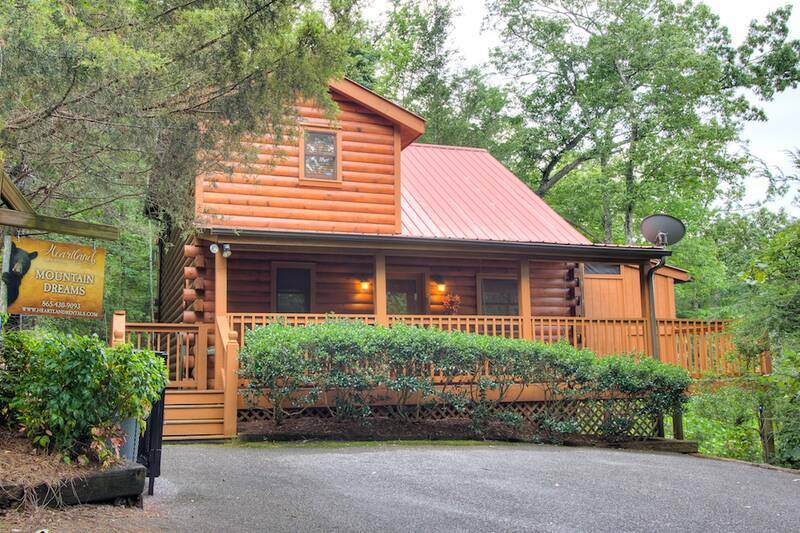 This beautiful log cabin is located between both towns of Gatlinburg and Pigeon Forge! 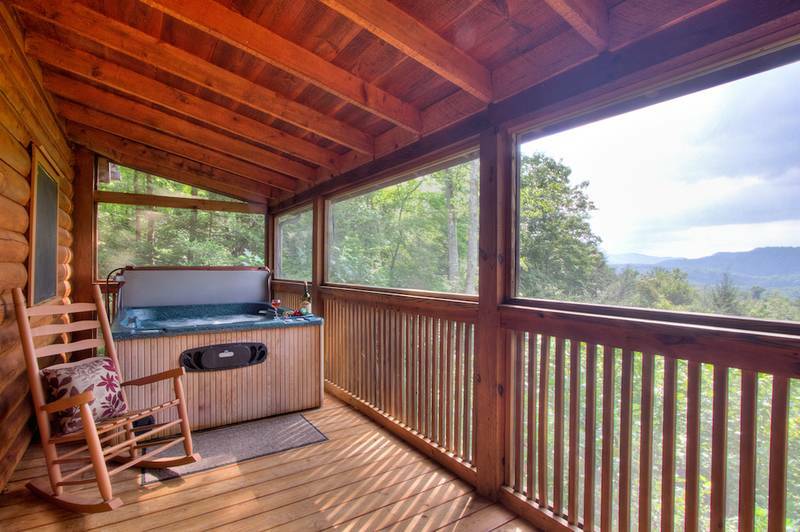 This cabin rental features tons of amenities as a hot tub, Jacuzzi, Sauna, Flat Screen TVs and the beauty of the Smoky Mountains from your very own deck. Come and enjoy Mountain Dreams! Perfect cabin for our family of 3! 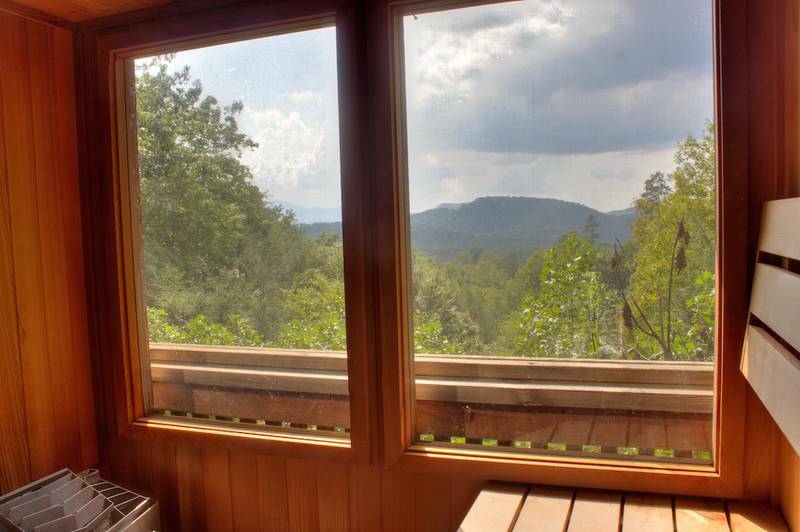 Mountain Dreams is a great private cabin with unobstructed views of the mountains. We enjoyed relaxing in the hot tub each day and also watching a few football bowl games! With 2 separate bedrooms our family of 3 had plenty of room. This is our second stay in this cabin and we will return! My first time booking a cabin and let me tell you I was extremely happy I did. The cabin had spectacular views an Heartland’s staff was awesome can’t wait for my next trip out. Staff was courteous! Love the privacy of the cabin and the fact that it was clean and sufficiently stocked. Location was half way between Pigeon Forge and Gatlinburg making it convenient to all the attractions and shopping. The cabin is beautiful and the view is breathtaking. The cabin is close enough to Pigeon Forge that we easily accessed restaurants and activities that we wanted to enjoy. It was just what we were looking for in a quiet get away. Had one small issue with an exterior door handle and it was addressed/fixed immediately. Very close to Dollywood and Gatlinburg; the two locations we visited. Took the trolley to both locations. It was great because we saved money on parking at Dollywood and enjoyed leaving the driving to someone else to enjoy the view on our way to Gatlinburg. Would stay there again. We loved over stay at Mountain Dreams. The staff was great. Our cabin was clean, and worked for all of our needs. We would recommend Heartland Cabin Rentals & Mountain Dreams to anyone. Beautiful views, and cabin. Peaceful. Really enjoyed the cabin. Thanks so much. This is one amazing cabin that exceeded our expectations. We had a great time! Cabin was perfect! This cabin met all of our expectations! The staff was great and very accommodating. Thank you Heartland Rentals for your great hospitality. Very nice cabin and location is great!! We had a great time and the cabin was great. Couple minor plumbing issue's that were taken care of asap as they were discovered, but overall a very well decorated cabin and located in a great location. Great family getaway for rest and relaxation. The staff with Heartland Rentals were so courteous and nice. There was a risk if some bad weather, snow and ice, the staff contacted me to make sure I was aware and could prepare for it. The cabin was conveniently located and easy to get too, very clean and comfortable. An absolute pleasant experience from start to finish. The staff (especially Ashley) were very patient and helpful in answering all of my questions during and leading up to my booking. The cabin was beautiful and spotless. Everything was exactly as advertised. I was going to book the rentals that Dollywood offered in their packages but my wife found Heartland Rentals through a google search and it saved us almost $500. I don't know if we are going back to Pigeon Forge, TN anytime soon but if we do go back I know where we are staying. We enjoyed our cabin very much. This cabin is really nice the only problem we had was the door battery was Dead but it was fix very quickly, but overall this cabin is nice!! !We will be back!!! very nice people The process was very simple and easy!!! Only suggestion is I would look into replacing the dishwasher. We really enjoyed our stay at the cabin. It was very comfortable and had great amenities. The staff at the rental office (in Pigeon Forge) were very helpful, especially when we got lost trying to get back to the cabin. The view was spectacular from the cabin. We would definitely stay again. Overall pretty good. The view is nice and the staff was nice. As far as the cabin goes, it was overall pretty good. Nicely decorated and the view is good. Amazing views and comfy cabin! This cabin has comfy beds and is a convenient drive to the closest grocery store (6 minutes according to the clock in our vehicle.) The views are amazing! We really like this cabin and hope to stay here again! The cabin was clean and very easy to find. The hot tub and sauna were a great way to relax. Everything was just as described. The only issues we had were the hot tub had no steps so it was difficult to get in and out of and there was only one small frying pan. But the cabin and Heartland were great! The office was extremely friendly. And checked on us several times. It was clean and exactly what was described on the web site. 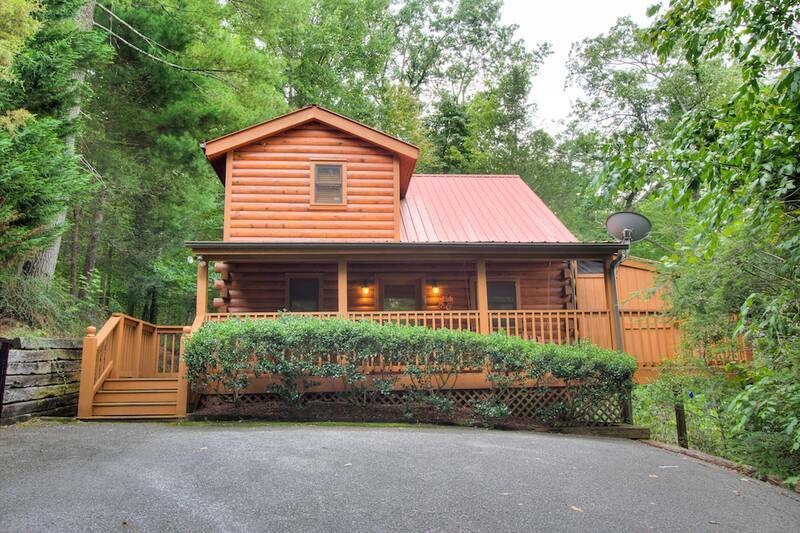 Great location easy access from Gatlinburg or Pigeon Forge. Clean, great mtn. view, quiet, staff was very helpful, thanks Ashley!!! We have visited Mountain Dreams many times and have a relaxing visit. We didn't have enough wash clothes and the electric door lock stopped working. We contacted the office and the nice ladies there were very helpful and brought us the wash clothes immediately. She also helped us get the spare key out of the box and we had to use it for the rest of the day. The hot tub was very nice and relaxing. Everything was great. There were a few things that could have been fixed such as loose door knobs and towel bar but nothing that interfered with our great time and great stay. Booking was easy, ladies at the front desk were friendly and helpful. Definitely plan on visiting again soon! Location was perfect. The cabin was perfect for us all (two couples). Wonderful beds. Well appointed and clean. We enjoyed the setting. Couldn't have asked for more! The cabin was beautiful and very comforatble and had a fantastic in a quiet wooded setting. We loved the location in a quiet wooded setting on top of a mountain. Although, it felt as if we were out in the country, we were just minutes from Pigeon Forge, Gatlinburg, and the National Park. The interior was clean, well appointed and decorated; the furniture was very comfortable. The process was great the cabin was fantastic, the view fantastic, the location fantastic. About 10 minutes to Pigeon Forge, about 15 minutes to Gatlinburg. I will definitely be back, may try a different cabin, although Mountain Dreams was great for 4 people. We went for a weekend getaway and the cabin couldn't have been any more perfect. Very well maintained and clean, and a great view. I would definitely recommend. The cabin is beautiful cosmetically. We enjoyed our stay, everything worked, the view was great. The only downside for me was the lack of insulation room to room. I stayed in the master room and you could hear every sound from every room in the cabin. Made it difficult to sleep. But then again 7 and 8 year old kids are non stop noisy. We will be back. The service was also great! We had a nice relaxing stay & a priceless view ! The cabin far exceeded our expectations in every way! The views were gorgeous and had a very "at home" feel. We absolutely love coming to Mountain Dreams. My husband & I are able to relax and enjoy the hot tub. We liked the Fun Pass that was available; that was a nice touch. The only negative I could say is the dishwasher doesn't work properly and we didn't realize it until we were getting ready to leave and took the dishes out. We rewashed them and put them up. We miss it already! 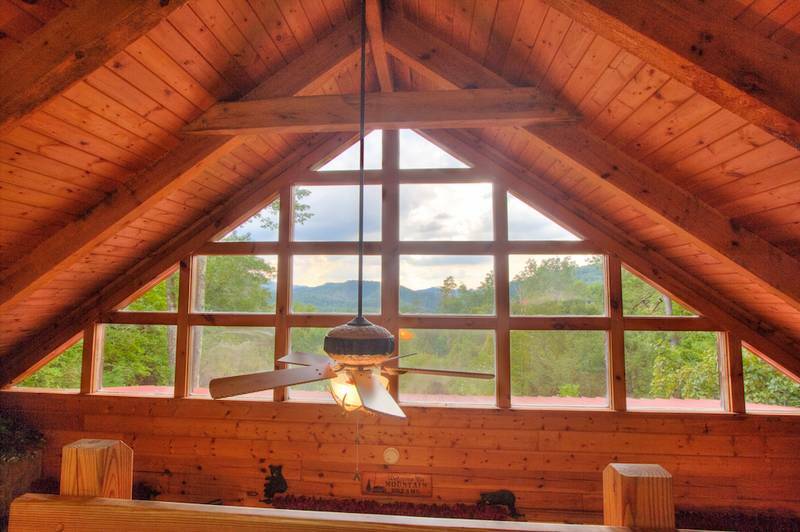 The mountains are gorgeous and the view from this cabin is amazing! The staff was very helpful! When we needed something, we received open arms support. Would love to come back very soon! Recommended to ANYONE and EVERYONE!!! We have loved both the cabins we have stayed in with Heartland and will continue to come back. Cabin was great. Great location . easy to get to. Wonderful vacation with our friends in this cabin! This is the 2nd time we have stayed in this cabin, and we love it. We were glad to see the cats this year, and another one with them. They are really sweet. Everything was clean and beautiful. We especially love the side porch that is screened in so we could sit there in the night with no bugs to bother us. The check in staff was very helpful and we sure enjoyed the Lumberjack Feud Dinner and Show. Hope we can come back again next year, as we always enjoy our stay in the Great Smoky Mountains of Tennessee. Cabin was nice and clean. Good view off the back porch. We did have three feral cats that wanted to come into the cabin so we had to be on the look out for them. That was the only thing close to being wrong. But we did not feed them and they left after three days. Our stay was excellent and will rent this cabin again. Everything was as described on the website. Great location! We will rent this cabin again!!! The beauty of Mountain Dreams and the surrounding area greatly enhanced our vacation inTennessee. Our experience with Heartland Rentals was awesome right from the beginning. The pictures and the description of the different cabins on their website made it easy for us to choose the one we were looking for. Upon arrival, we found Mountain Dreams to look exactly as it was pictured and described. From the reservation process all the way to the day we left, we were very pleased with the service Heartland Rentals provided. Our washer didn't work and with one simple phone call, they came out and fixed it right away. We highly recommend them to anyone looking for a cabin to stay in during their visit to the Gatlinburg - Pigeon Forge area. We will definitely be back to stay with them again. Great cabin, spotlessly clean, great location; just right for our family needs. 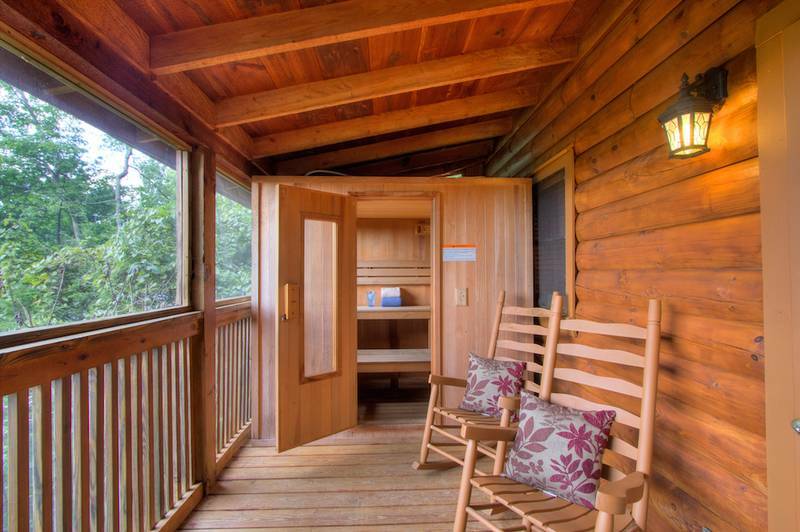 This is a delightful two bedroom/two bathroom cabin. We were there with our son & daughter-in-law for a wedding and it was perfectly located to all the entertainment that we wanted. The cabin was spotlessly clean and in very good order. We'll be back to rent again. Nice cabin. Perfect for four. Was convenient location to do anything you want to do in the area. Over the last four years of vacations we have always rented with Heartland Rentals and have been very happy (rented two different cabins during this time frame---if we like a cabin we try to rent the same one each year). Mountain Dreams is a great cabin, we feel right at home there. Since we do rent with HR each year we have run out of things to do within the Gateway To Fun Pass freebees-would be great if next year some shows/attractions were swapped out for new ones. As always---thanks!! Mt Dreams was nice, clean and with other cabins around, it was very quiet & peaceful. Very nice!! Relaxing!! Cabin was clean, nice and very convenient to Gatlinburg and Pigeon Forge. Our stay at the cabin was Freaking Awesome! We loved everything about it. The hot tub was probably the highest point. The only thing that might be nice would be to be able to just get the key code without needing to make a visit to the office. Overall, absolutely perfect! Our family loved our stay!!! This cabin was very clean, nicely decorated! The hot tub and sauna were awesome! We had a wonderful stay! We had the best trip staying at Mountain Dreams! The cabin was so nice and decorated for Christmas! That was a great surprise since my whole reason for going was to get into the Christmas spirit. The staff were so helpful and nice! The view was fantastic and we loved everything. Can't wait to come back again! Loved it more than we did last year. We rented the same cabin as last year and loved it even more. The new decor made it seem like a different cabin but with all the same great ammenities! The check-in and check-out process is so easy and the staff is so friendly and nice to talk to about everything. This cabin has everything we could ask for. The view is fabulous, especially with the fall foliage. The location of the cabin makes you feel you are isolated from your neighbors. 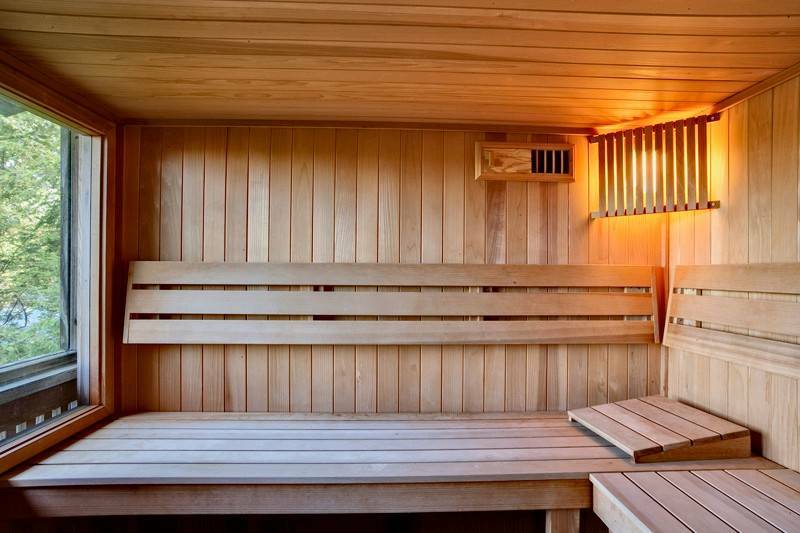 The jacuzzi and hot tub are nice, but the sauna is my personal favorite. The place is equipped with all the appliances, cook and tableware to make you self sufficient. The internet still allowed us to stay in contact with our friends and family. Can't wait to stay here again next year. Very enjoyed our stay at Mountain Dreams. It was close enough to everything we wanted to visit but still far enough off the "beaten path" to enjoy our private family time together. While we arrived on a Sunday and did not interact with the staff in Pigeon Forge, the representative we spoke with in Gatlinburg was very helpful. We had absolutely no issues with checkin/out. Once again a very positive experience. My honest and candid review is that it is a very nice cabin - very clean and well kept. The living room/ family room area is *very* small. However, the bedrooms are both very large. The price was a little high to me compared to other cabins BUT this one has a washer/ dryer, fireplaces - one in family room and one in master bedroom, and a sauna as well. I don't find the washer/dryer necessary but it is nice to be able to dry clothes or towels after using hot tub. The sauna is such a nice added feature, I really liked it. It wasn't very secluded as your neighbors are quite close. The hot tub jets worked great. I would *really* like to have had a hair dryer but there wasn't one. It was very nice of the office to contact us when the cabin was ready which was hours earlier than check in. We were already in town shopping and didn't get there until later but still a nice gesture. We we're extremely pleased with our stay in "Mountain Dreams"
Right from the start, Holly, at your Teaster lane office, was very welcoming and helpful. We would definitely love to come back and stay there again! Thanks for making our vacation so memorable. Our family loved the log home. 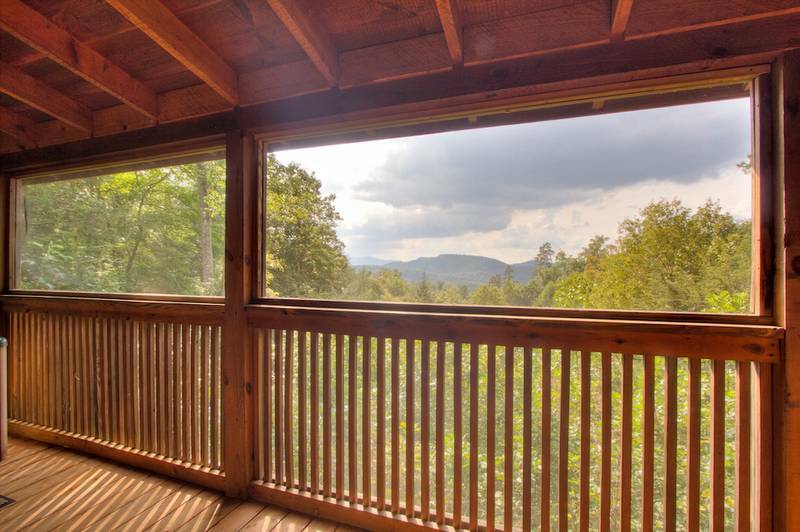 The location was excellent for the views and so close to both Pigeon Forge and Gatlinburg. We sincerely hope to rent this home again.